Painting “Waterloo Bridge. The effect of fog “Monet is a prominent representative of the series of works of the artist, which he dedicated to London. The artist depicted the view of the London Thames through the wall of air and snow fog. This kind of fascinates and attracts, and I want to look at and consider this endless water surface. 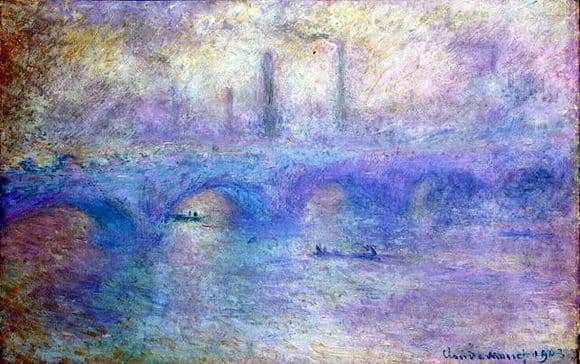 The fog is depicted very realistic, the painter used many color transitions. The range of shades is very harmonious and creates a soothing look. This work is striking in its genius, the details of the picture can be viewed only from a distance. Only in this way is it possible to fully recreate the popular landscape. Through the dense fog, it’s realistic to look at the images of boats with people, the Waterloo Bridge and the shadows of working plants. The master did not use color contrasts and a classic black tint for drawing. The series of works was timed to coincide with the anniversary of the victory at Waterloo and, accordingly, the opening of the bridge in honor of this event. The artist wanted to write the bridge itself, but in the process of working, other characters and details always came to the fore. This was the reason for the creation of several works under the general theme. To portray this view through the thickness of the impenetrable fog, allowed to give the work a purely English atmosphere. The painter completed his work already in his workshop in France, so the picture has a bit of a fantasy character. Thus, the artist conveyed his emotions, which seized him when he visited the capital of Great Britain. To complete the work, it was necessary to use a large number of tonal transitions that would create a fog effect so realistic. The bridge connects the industrial part of London, and people in boats symbolize life and movement. Such a quiet and peaceful life that gave the victory at Waterloo.